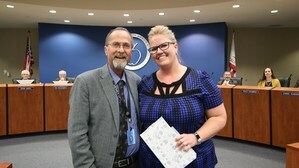 The Governing Board of the Hemet Unified School District, on nomination by Trustee Patrick Searl, has selected Chelsey Hallberg, Counselor at Rancho Viejo Middle School, as the January recipient of the Governing Board Recognition and Award. Chelsey Hallberg received her Bachelor of Arts in Psychology and Bachelor of Arts in Criminal Justice from California State University, San Bernardino in 2003. She received her Master’s Degree in Counseling from the University of Redlands in 2007. Ms. Hallberg is truly an exceptional leader on behalf of the students at Rancho Viejo. She supports the school site with several key initiatives that touch on academics, behavior and social-emotional well-being. Chelsey has worked hand-in-hand with our AVID site team and site administration to develop and implement Academic Probation Meetings that utilize AVID strategies to help students improve academic outcomes. She has also built several strong partnerships during the past four years as a founding member of the Rancho Viejo PBIS team. She currently serves on the Tier 1, 2 and 3 teams that support the district in the School Climate Transformation grant. This work has allowed Rancho Viejo to pilot several strategies that reduce negative behaviors and help to build assets with students. In addition, Chelsey has worked diligently to create partnerships that have enhanced the PLUS program at Rancho Viejo, and has led the charge to develop an elective class at the site that will fully develop peer leaders. Most recently at the district level, she has served on committees that have planned and carried out district-wide PLUS forums that help to unite our peer leaders in making sure every member of the HUSD family feels loved, supported and cared for. Chelsey Hallberg is deserving of this recognition on behalf of her work to support students and staff. 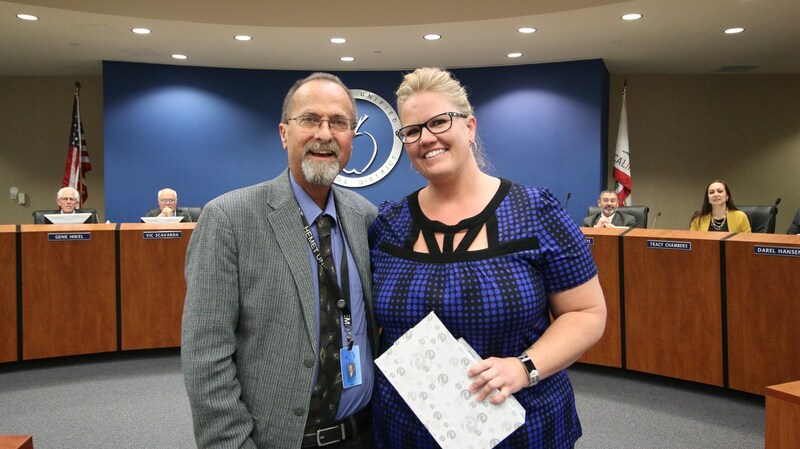 For outstanding performance, professionalism and loyalty to the Hemet Unified School District, Trustee Patrick Searl presented Chelsey Hallberg with the Governing Board Recognition of Excellence Award and a $500 certificate to use toward the District program of her choice.